Supreme Court Justice Clarence Thomas’s insights are reshaping law and policy for the better. In his office hangs a copy of the 13th Amendment, which abolished slavery in America. When his critics, and he has many, call him names, he likes to point to it and shout out, “I’m a free man!” This black history month is an opportunity to celebrate the most influential thinker on racial issues in America today—Supreme Court Justice Clarence Thomas . Justice Thomas, who has been on the court nearly a quarter-century, remains a polarizing figure—loved by conservatives and loathed by liberals. But his “free”-thinking legal opinions are opening new roads for the American political debate on racial justice. His opinions are rooted in the premise that the 14th Amendment—guaranteeing equal rights for all—cannot mean different things for different people. As he wrote in Fisher v. University of Texas (2013), he is opposed to “perpetual racial tinkering” by judges to fix racial imbalance and inequality at schools and the workplace. Yet he never contends racism has gone away. The fact that a 2001 article in Time magazine about him was headlined “Uncle Tom Justice” reminds us that racism stubbornly persists. His only current rival in the race debate is President Obama. At moments of racial controversy the nation’s first black president has used his national pulpit to give voice to black fear that racial stereotyping led to tragedy. But that is as far as he is willing to go. His attorney general, Eric Holder , has gone further by calling Americans “cowards” when it comes to discussing race. And some critics have chastised him even for that. Justice Thomas, meanwhile, is reshaping the law and government policy on race by virtue of the power of his opinions from the bench. Thurgood Marshall, the first African-American on the Supreme Court, stood up as a voice insisting on rights for black people. Justice Thomas, the second black man on the court, takes a different tack. He stands up for individual rights as a sure blanket of legal protection for everyone, including minorities. The principal point Justice Thomas has made in a variety of cases is that black people deserve to be treated as independent, competent, self-sufficient citizens. He rejects the idea that 21st-century government and the courts should continue to view blacks as victims of a history of slavery and racism. Justice Thomas holds that quality education should be the focus of educators for children of all races and argues there is no proof that integration necessarily improves education. Black leaders, from Martin Luther King Jr. to Thurgood Marshall, he has noted, were educated at black schools. He also makes the case that diversity in school admissions has never been proven to raise black achievement to the level of people admitted with no special consideration. “Racial imbalance is not segregation,” he wrote in a 2007 case ending Seattle and Louisville plans to reverse racial segregation in schools, “and the mere incantation of terms like re-segregation and remediation cannot make up the difference.” Federal judges, he said, are “not social engineers” charged with creating plans to achieve racial equality. This line of thinking has helped to rein in ambitious diversity and desegregation plans in K-12 schools as well as at universities. 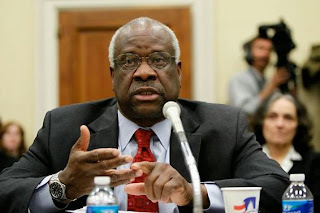 It has also made Justice Thomas the target of liberal derision. Mississippi Rep. Bennie Thompson once said he simply “doesn’t like black people” or “being black.” Nevada Sen. Harry Reid once dismissed him as one of “five white men” on the high court. Paradoxically, these bitter attacks are still more evidence that Clarence Thomas is now leading the national debate on race. Mr. Williams is a political analyst for Fox News and a columnist for the Hill. He is the author of “Thurgood Marshall: American Revolutionary” (Times Books, Random House, 1998). The warnings that Daniel Patrick Moynihan sounded 50 years ago have come true. Will liberals ever forgive him? Will liberals ever forgive Daniel Patrick Moynihan for being right? One important lesson of the past half-century is that counterproductive cultural traits can hurt a group more than political clout can help it. Moynihan was right about that, too.